Remove tofu from packaging and wrap it with several paper towels to soak up excess liquid. You made need to do this step twice to remove all of the liquid. Cut tofu into 1/2 inch pieces. Place a medium-sized frying pan on medium-high heat. Once it is warm add the olive oil and spread it around to coat entire pan. Let it warm up for 30 seconds or so and then add tofu spreading it evenly in the pan. The tofu should sizzle when added. 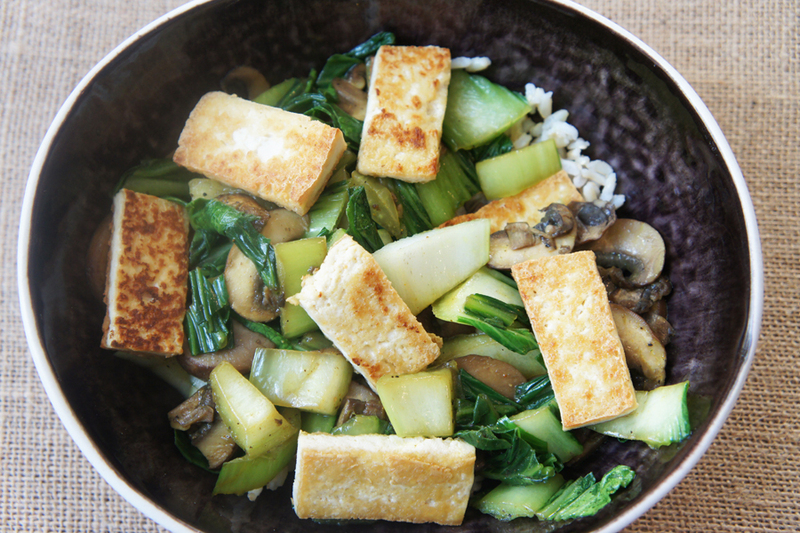 Leave the tofu undisturbed until it begins to brown about 7 minutes. Flip it over and brown the other side about 3-4 minutes. While the tofu is cooking heat coconut oil in a medium saucepan on the stove. Once pan is hot add mushrooms, a little salt and pepper and saute for 1-2 minutes and then add bok choy and saute until bok choy is slightly wilted and mushrooms are browned. About 5 min. Remove everything from stove, mix, season with tumeric and serve over brown rice.